Jewish wedding ceremonies are steeped in tradition, and I love photographing unique moments such as the signing of the ketubah or, for Orthodox weddings, the Tish. 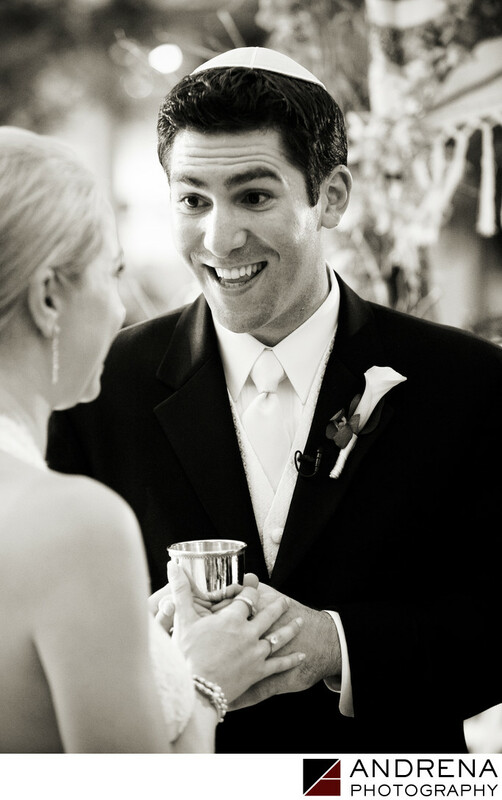 During a Jewish wedding ceremony, the rabbi will ask that the bride and groom to drink from the kiddush cup, which symbolizes the beginning of life and growth. The next sip of wine is for Sheva Brochot, or the Seven Blessings. It's not always easy to grab shots of the kiddush cup in action, since the families can be crowded very tightly around the couple underneath the chuppah. But I'm determined. I adore this shot of a Jewish groom excitedly handing the kiddush cup to his bride during a wedding ceremony at Skirball Center. Animated expressions add so much emotion to the photographs. This wedding was published in Ceremony Magazine. Jewish wedding photographed at Skirball Cultural Center in Los Angeles, California.